Super Beat Sports has hit the eShop as a brand new rhythm-based Nintendo Switch exclusive from Harmonix, and this is one Nindie you really need to have an eye – and ear – on. That’s right, Harmonix. Sounds familiar, right? That’s because they are the guys that brought you Guitar Hero and Rock Band, so as far as rhythm games go, there is real pedigree here. These guys really know their stuff. But what I perhaps didn’t quite expect is just how much character and soul and downright joyous fun they were able to inject into the genre. It’s this combination of addictive yet light-hearted gameplay and gorgeous cartoon artwork that makes Super Beat Sports a tailor-made Switch delight. In fact, the only thing absent from making this a stone cold Nintendo classic is the guest appearance of a certain pair plumber bros. Now that would be something. DLC perhaps? One other important point of note is the breadth of co-op multiplayer action that makes it stand-out as particularly relevant on the sharing-is-good hybrid console, but more on that in a bit. The premise of Super Beat Sports is rather cute, but given the focus of the supremely fun gameplay, the story definitely takes a back seat. If that. The game is set on an Earth-like planet in the alien galaxy of Muzicalia where the inhabitants love nothing more than rocking out to awesome music, while playing sports in packed out stadiums. Hey, who said video games had to make sense? 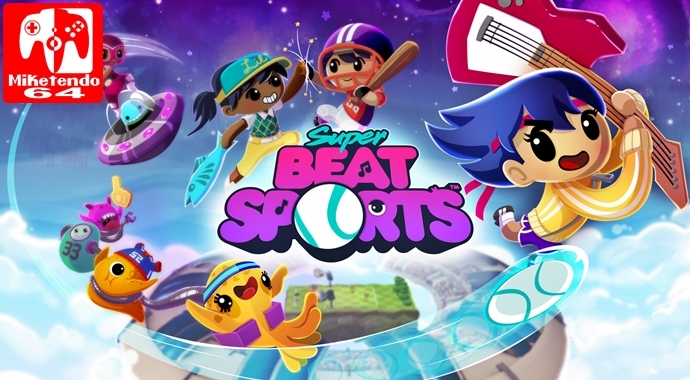 Gameplay wise, Super Beat Sports consists of five different rhythm-based sports. These are Whacky Bat, Net Ball, Gobble Golf, Buddy Ball and Rhythm Racket. Whacky Bat is very much like baseball where you’re pitched balls that need to be hit in time with the beats of the music. Different aliens pitch their throws at different speeds and you’ll even face a curveball or two. Next up is Net Ball, which surprisingly, is closer to beach-style volleyball than it is to its namesake net ball. You play 2-on-2 where, for single players, your partner is controlled by a very accommodating bot. Again, hit, return and spike the ball in time to toe-tappingly good tunes. Then we have Gobble Golf, which this time, plays exactly how you’d expect. You play golf and strike the ball into the mouths of hungry aliens. Unlike the first three mini-games, which by the way, are the standouts in the package, Buddy Ball is geared more towards multiplayer. Here you face off against either a friend or a bot to strike pitched serves, which are very similar to Whacky Bat. Finally, we have Rhythm Racket, which is an air/ice hockey affair. Again, it’s a lot of fun, just not quite as much as the previous games. Visually, Super Beat Sports really looks the part. The art style is purposely toony and very family friendly, which means it fits the Nintendo Switch like the proverbial glove. As you would expect from a rhythm game made by Harmonix, the Music is seriously good, super catchy and marries up to the gameplay and overall toontastic look and feel of the game. But this is something you definitely have to experience for yourself. Don’t make the mistake of watching some gameplay on YouTube and assume you’re down with it. It isn’t until you’re in the thick of the action, chaining a great run to the beat while dashing between lanes and slugging balls back to whence they came. How Super Beat Sports really ‘feels’ when you’re in the groove can’t really be truly felt by reading a review or watching some gameplay. The first two minigames are for 1-2 players, while Gobble Golf, Buddy Ball and Rhythm Racket are for up to four players. All five mini=games feel great in single-player, but add a friend – or three – to the mix and Super Beat Sports really shines. Whether played on your own or with a friend, and in both handheld and docked modes, performance was always on point and a ton of fun to boot. Super Beat Sports looks good, sounds great and plays even better. Add friends and it shines brighter still. Harmonix’s Switch debut is the gift that keeps on giving and it never misses a beat. Yes! I played the demo and loved it. Bought the whole game and loved it even more. Fantastic game.